To select your size, compare your natural, uncompressed body measurements with the size chart, then select the size that is the closest match. Choose from standard sizes for moderate waist reduction, or select standard tight-lacing sizes for more dramatic waist reduction (an extra 2" off the waist). Standard tight-lacing sizes are available at no additional charge! Please refer to my measurements page page for more comprehensive instructions. 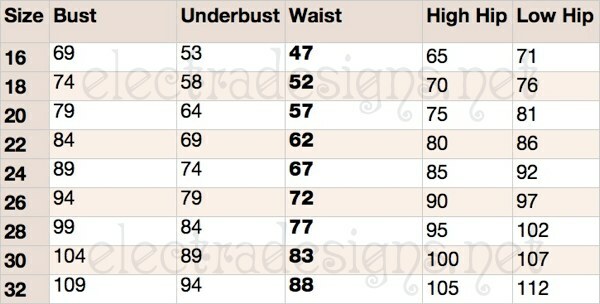 If your proportions differ greatly from those on the size charts, a fully custom corset may be more appropriate for you. Please, select your size carefully. All corsets are made to order. There are no refunds, returns or exchanges. The size charts are for standard sized corsets only. If you would like assistance selecting your corset size, please email Alexis with your measurements. 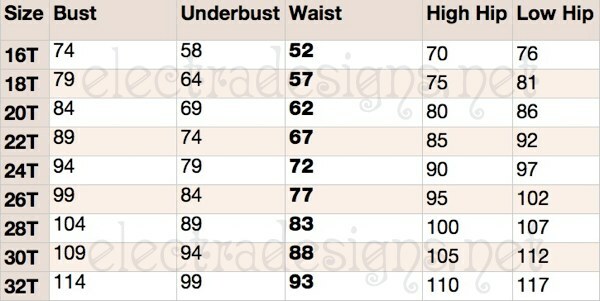 Be sure to mention what corset style you wish to order.